Turkey isn’t Egypt, where millions of citizens supported the military’s removal of President Mohammed Morsi in 2013–a situation about which the Obama administration managed to finesse the military’s action and outmaneuver congressional restrictions on U.S. aid to countries affected by military takeovers. With the exceptions of Israel and, recently, Tunisia, the U.S. has been dealing with military or authoritarian governments in the Middle East since well before the Arab Spring. Authoritarianism, not democracy, is the most common form of governance in the region. For most of the past half-century, Washington dealt with adversarial authoritarians–Hafez and now Bashar al-Assad, Saddam Hussein, Moammar Qadhafi–or acquiescent ones: Hosni Mubarak, Ali Abdullah Salah, Zine El Abidine Ben Ali, Yasser Arafat. In the Gulf today, the U.S. depends on Arabian kings and emirs or the mullahs in Iran as partners. U.S. administrations, prizing stability, have concluded that a badly governed state is better than no state at all. That’s the logic Washington has applied to dealings with Mr. Erdogan. That’s why the Obama administration ultimately allowed the government of Egyptian President Abdel Fattah El-Sisi, a serial abuser of human rights, to come in from the cold; it’s why various U.S. administrations have made exceptions for the Saudi government’s export of Wahabbist ideology over the years; and it’s how U.S. officials rationalize dealing with an Iranian government that might be abiding by the letter of the nuclear agreement but has continued to stoke conflict in the region and that abuses its own citizens. When it comes to Iran, the U.S. and others have imposed sanctions in response to some behavior. But the U.S. also compartmentalizes relations–cooperating sometimes, imposing penalties other times, and often acquiescing or ignoring actions it can’t control. The character of the Middle East has long been clear–and cannot be determined or changed by some external force or idealized “freedom agenda” or speeches about the virtues of democracy. It is quintessentially American thinking to assume that either through persuasion or pressure the United States can fundamentally shape or influence how other governments treat their citizens. Human rights is not the central issue determining U.S. policy toward any friend or adversary in the region. The Obama administration seems to realize the U.S. doesn’t have the will or skill to carry out social and political engineering in countries led by authoritarians and strongmen for whom the stakes are existential–and who are prepared to push back much harder than Washington is willing to push. U.S. partners in the region are imperfect. Even the Israelis–close allies who share many common values–have fundamentally different views of what to do about key issues such as the Palestinians. And whether we’re talking about Egypt, Saudi Arabia, or Turkey, if the U.S. pushes to align its values and interests in some scripted formula based on how Americans see the world, Washington would soon have no partners to deal with. 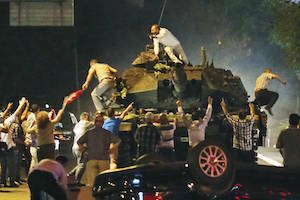 Had Turkey’s military succeeded in seizing power and the public supported it, there might have been a lot of noise. But ultimately the Obama administration would have effectively said: The king is dead; long live the king. That Mr. Erdogan is an elected autocrat would have made that transition even easier.